Many modern drivers like to operate relatively large vehicles. These drivers prefer bigger vehicles for many good reasons that include greater safety, more interior space, and greater towing capacity. While many large vehicles do provide such benefits, they also come with some potential drawbacks. One such drawback is a subtle loss of visual fields because of vehicle size. The good news is, the Ford Co-Pilot360 system offers drivers a suite of technologies that can greatly mitigate blind spots and other inherent hazards. Two such technologies are the reverse camera systems as well as automatic high beam control. While small vehicles are often easy to reverse and park, trucks and SUVs can be a different story. Due to their length and bulk, trucks and SUVs often have built-in blind spots that can harbor hidden dangers. 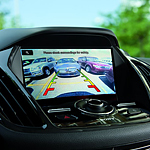 The Ford Co-Pilot360 reverse camera system does away with this hazard by providing drivers with clear views of what lies behind their vehicles. Another system that can help drivers to increase their awareness is the automatic high beam service. This system uses cameras and other sensors to estimate the proximity of oncoming vehicles. If and when such vehicles get too close, the automatic high beam system can dim headlights without driver intervention. It can also reestablish high beam operation when any potential hazards are gone.